Posted on March 7, 2013 by Lena K.
A few weeks ago, I came across an internet service which allows you to purchase items from Japanese stores and have it delivered outside of Japan. Most people that tried buying stuff from Japanese online stores surely already know just how hard it can be to find ones that actually deliver their items internationally. I’ll tell you how I exactly got that to work in one of my next posts. 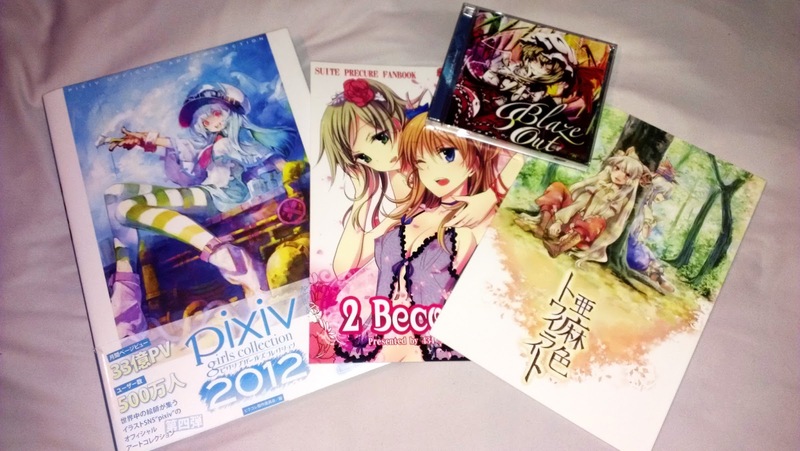 What you can see here (left to right) is the pixiv girls collection 2012, isya (434 Not Found) – 2 Become 1 doujin, Vivit Gray – Flaxen Twilight doujin and EastNewSound – Blaze Out album. The thing I wanna point out here is that I bought these even though I already have the translated versions of the doujinshi and even all the songs from the album on my laptop. Even if I can’t read nor understand Japanese, I thought that I should at least support my favorite artists like this. Reading these doujinshi online might be easier, and of course it’s free, but that just doesn’t support the artist behind these works at all. Besides, isn’t it very nice to not only have the things you like as files on your computer, but as actual books or CDs? This entry was posted in Other and tagged 434 Not Found, isya, mail-order, Vivit Gray by Lena K.. Bookmark the permalink. I'm off to check for more posts with 1 comment that may have been deleted. Tschüss! Oh I deleted a comment and still left it there?